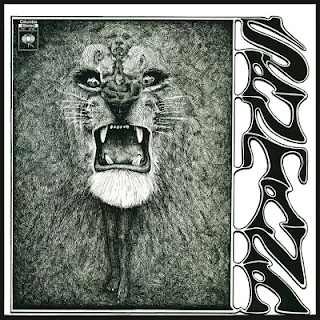 This is the debut studio album by the now-legendaryLatin “fusion” rock band Santana released in 1969. Over half of the album's length is composed of instrumental music, recorded by what was originally intended to be a purely free-form jam band. At the suggestion of manager Bill Graham, the band took to writing more conventional songs for more impact, but managed to retain the essence of improvisation in the music. This remained throughout their career. After the band played a storming set at that summer’s Woodstock festival, the album was eagerly awaited. It is packed with great Latin-flavoured, rhythmic instrumentals, such as the intoxicating “Jingo” (which doesn’t have many vocals, but does have a few), “Savor”, the excellent, pulsating “Soul Sacrifice”, “Waiting”, which perfectly introduced the band’s organ/percussion/guitar sound, and the almost jazz-funky “Treat”. The stunning Latin percussion element of the band welded perfectly with Carlos Santana’s unique and now iconic lead guitar. “Evil Ways” was a single, and was the first example of their branching out into writing songs as well as instrumentals. A good one it was too. Rhythmic, infectious and invigorating. Despite having vocals, there were also lengthy instrumentals parts too. “Shades Of Time” is a very late 60s rock song, without quite so much Latin influence as others on the album, but with a stunning Carlos Santana guitar break, however. It segues perfectly into the Latin rock instrumental “Savor” and subsequently into the electrifying “Jingo”. Thrilling stuff for a debut album. “Persuasion” is more of a conventional rock song. Almost bluesy in places. “You Just Don’t Care” is a great slab of heavy rock. Putting a historical context on things, in 1969, this band really were quite unique. In many ways they remained so. Upon release, it did not get a good critical reception, which was somewhat unfair, particularly considering the band were very young at the time. It is viewed more positively in retrospect though. All things considered, it is an astonishingly mature debut album. The three bonus live tracks serve as examples of just what a great live band they were.